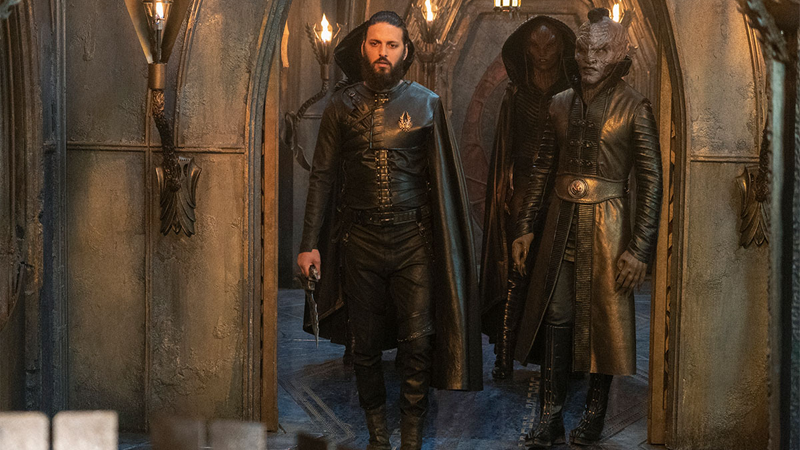 The first few episodes of Star Trek: Discovery’s second season felt like a big break from the giddy ups and downs of its first. The show has been constantly reminding us that its new additions to the formula are nothing like the new additions to the formula that it had last season, as it zips around on fun new missions. It’s almost felt like a new show that just happened to have some Discovery faces on it. Hell, there wasn’t even a Klingon in sight, after all their importance! It was as weird as it was refreshing. 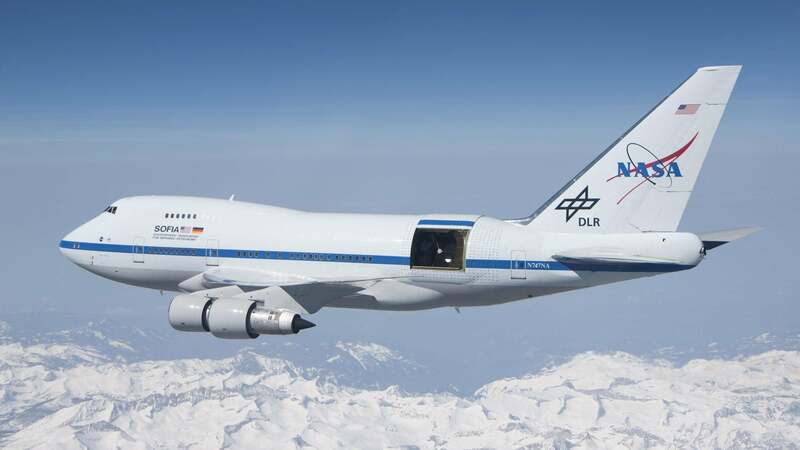 But it turns out that Discovery was really just biding its time before some of the wider impact from the...let’s say questionable decisions made to secure peace between the Federation and the Klingon Empire at the end of season one began to raise their heads. “Point of Light” was all about bad choices in the past coming back to haunt the present — and not just due to fallout from season one’s climax. Some of those choices, at least in Burnham’s case, now stand to have a devastating impact on the whole galaxy rather than just her adoptive family unit. Drama so big you could doom the universe? 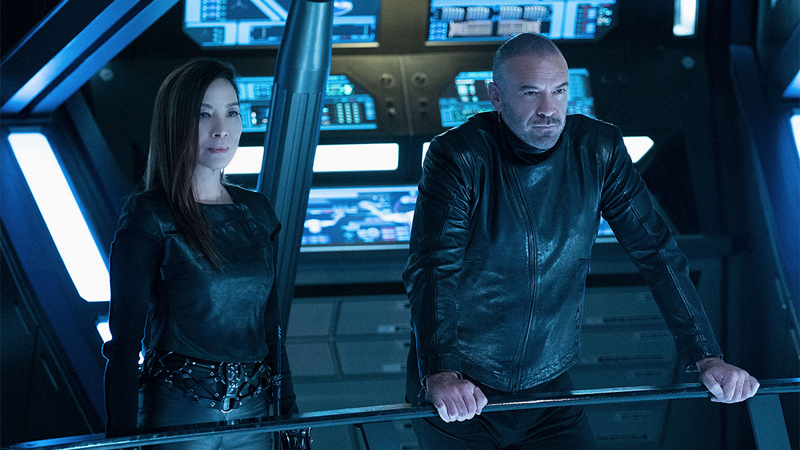 The hardships faced not just by Michael in the episode, but also L’Rell, are both deeply driven by the desires of families—and what either the Starfleet officer or the new Chancellor of Qo’noS are willing to sacrifice in order to keep their families safe. Let’s start with Michael, who finds herself surprised when Sarek’s diplomatic ship shows up in front of the Discovery carrying not her dad, but instead her mother, Amanda...who’s in a little spot of trouble. Mainly because, in a manner very much befitting her family, after learning that Spock self-checked into psychiatric care on Starbase 5, she tried to pay him a visit—and when she was denied access to her son, she took matters in her own hands by swiping Spock’s medical records and racing off to ask Michael and her captain to break several Federation laws and open them up. This family, you guys. They don’t do their drama by halves. And yet, Spock’s potential murder spree isn’t what ultimately threatens to break his already fractured family apart in his absence...it’s somehow Michael. After finding more etchings about the Red Angel — which first appeared to Spock as a child one night after Michael tried to run away from Sarek and Amanda’s guardianship — in Spock’s files, she reveals to Amanda that she saw the Red Angel herself. And not only that: As a child, fearing that the Logic Extremists that had targeted her following her adoption by Sarek would go after Spock to get to her, she pushed him away by doing something that, even now, she still thinks is so terrible she can’t bear to say it to Amanda. Whatever it actually was remains unspoken, but the reveal is seemingly enough to splinter Michael’s adoptive family even more. Amanda gives Michael a cold farewell, promising that she, rather than Burnham, will be the one to find Spock and bring him back safely, taking his medical files in the process. So now Burnham’s mission this season is actually going to be about bringing all the parts of her family back together again — herself and Amanda, herself and Spock, Spock and his parents. Which would be a tall task for anyone if failure also meant potentially dooming the universe to whatever the Red Angel’s mysterious signals are trying to impart. 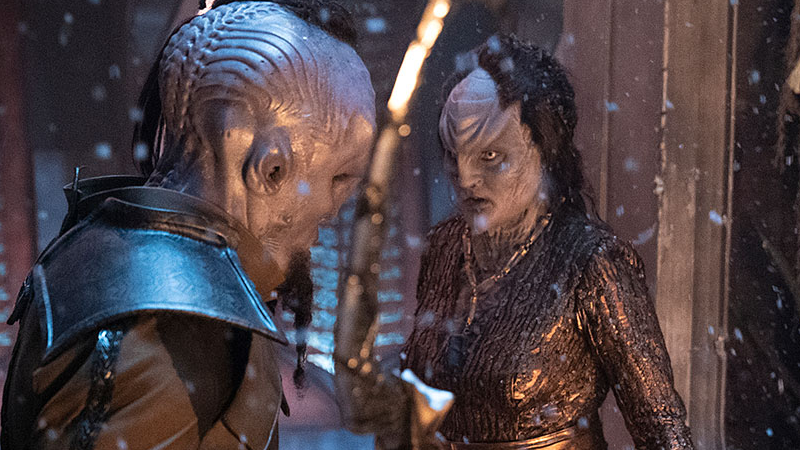 Burnham’s tribulations offer a fascinating parallel to L’Rell’s—or should that be paral’rells?—in this episode, as we finally check in with what’s up on Qo’noS for the first time this season. And what’s up? Not much good! Between making Ash Tyler — who’s still trying to reconcile Voq’s love for her and his own violation at her hands in his transformation process — her torchbearer, trying to rally the Klingons behind a new centralised fleet, the fact that she’s a woman from a house of renowned spies, and, oh, the fact that she’s basically holding the planet hostage with a giant Federation bomb, L’Rell’s tenuous position as the chancellor is on the brink. Sure, some of these are down to bad choices made by people who aren’t her, but she and Ash/Voq have been left to deal with their ramifications nonetheless. It doesn’t help that a plot to overthrow her is made much easier by two very silly secrets both L’Rell and Ash tried to keep from each other. In Ash’s case, a holo-call he makes to Burnham to warn the Federation that L’Rell’s threadbare peace is about to fall apart gets out to one of her rivals, Fleet Captain Kol-Sha, giving Kol-Sha the evidence to actually support staging their coup. In L’Rell’s case, she reveals to Ash that just before Voq underwent his extremely-violent-turduckening, she became pregnant with his child, keeping it hidden away to both remove a potential bargaining chip political rivals could hold over and to avoid having to tell Ash that he’s a Klingon daddy. All this culminates in, of course, everything going sideways for L’Rell—because like I said, this episode is all about people thinking they got away with making a bad choice and then learning they very much did not. Her baby gets kidnapped, her uncle — one of the only people she told about said child — gets murdered, and she and Ash get jumped by Kol-Sha. It’s only because of the intervention of another ramification of a bad choice that the two of them make it out alive. Once again, it’s not a bad choice that either L’Rell or Ash made, but really, another patented Michael Burnham Decision, because none other than Emperor Georgiou shows up to slaughter Kol-Sha and his fellow coup instigators, wielding some fancy tech and her very own Section 31 badge. As Burnham was galvanised with a mission to save the day by uniting her family, L’Rell is galvanised by having to break apart her own. At Georgiou’s heed, she realises that neither Ash nor her child can remain on Qo’noS. In order to maintain her Chancellorship, she informs the Klingon High Council that an attempt on her life failed, but resulted in the losses of Kol-Sha’s men...as well as both Ash and her baby, in the form of two very convincing severed heads she tosses into the planet’s lava-strewn surface while cementing her place now not as merely Chancellor, but Mother to a united Klingon people. 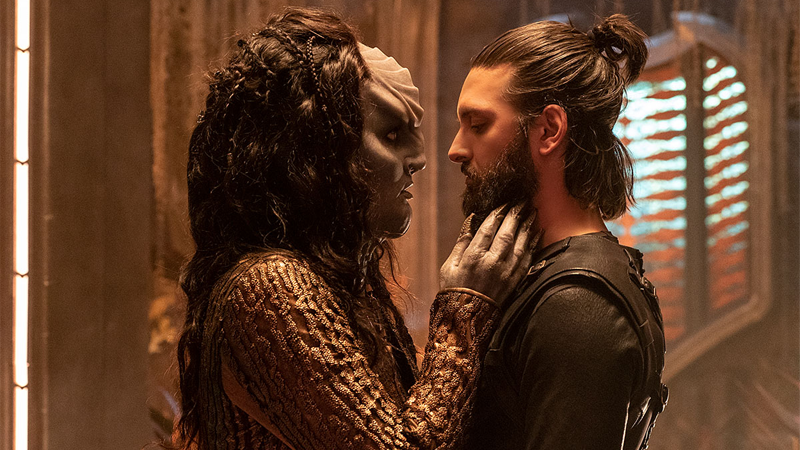 Of course, we know that Ash and the baby are still alive — the heads were fashioned up by Section 31, with Ash now a recruit aboard Georgiou’s ship and his child whisked away to a life in a Klingon monastery, never knowing his parents. Like practically every choice made in “Point of Light,” this at first seems like one that’s good but could ultimately end very poorly. For who though? L’Rell’s position at least seems safe for now. 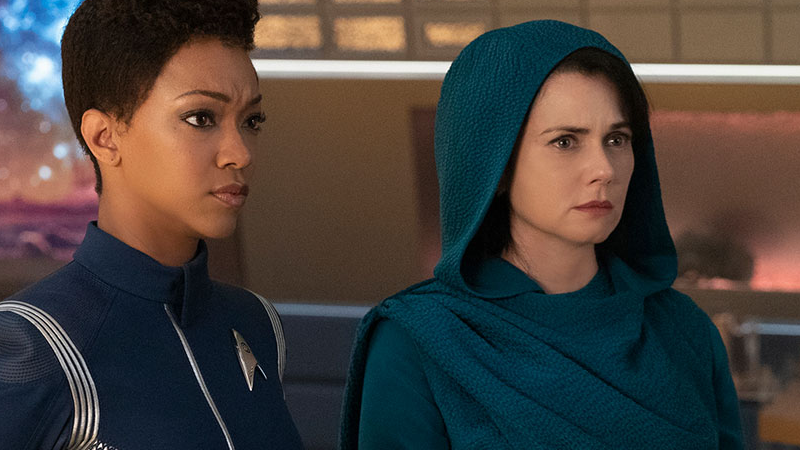 Maybe it’ll fall to Michael once again — after all, now she has two familiar faces within Section 31 to have to contend with on top of all the drama with Spock. Whether or not she’ll have to make the same decision L’Rell did to keep an uneasy peace remains to be seen. For all the nightmare stuff Michael goes through this episode, her brief moment with Tilly after her bridge-freakout is such a great little moment of warmth. “Show me a teenage girl who’s never cried. You can’t—I know, I’m a xenoanthropologist.” More Michael helping her friends and making jokes instead of having family drama!